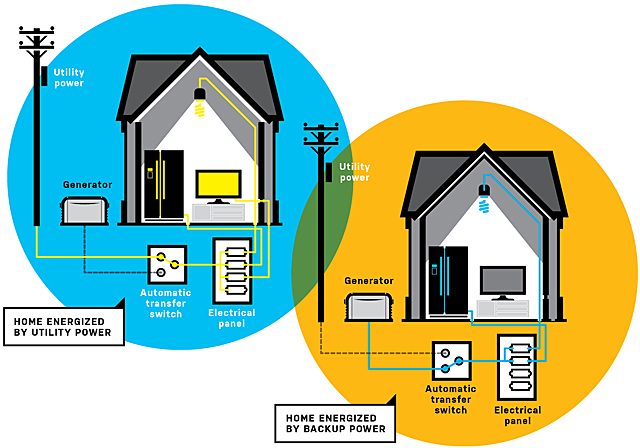 Home / Should I Purchase a backup generator ? Should I Purchase a backup generator ? Should You Purchase a Backup Generator? Blackouts are nothing new, but increased pressure on the power grid over the past two years have hammered home the importance of electrical power. Load shedding costs South Africa up to R11 billion a month, but it’s here until Eskom is back on track. Leaving families Powerless as everyday life continues . In fact, 2014 was among the nation’s worst years on record for grid-disabling with power interruptions longer than 24 hours affecting 21 million customers. Standby generators offer a steadfast solution to extended outages. Unlike portable generators, they’re installed permanently on a concrete pad in your yard and will provide uninterrupted backup for days. That’s because they’re connected directly to your home’s electrical panel and powered by an external fuel supply such as Petrol or diesel. Smaller, air-cooled essential-circuit units (below) are slightly larger than portable generators and can energize just a few circuits at a time. Larger, liquid-cooled whole-house systems will do just as their name suggests—they’ll comfortably power an entire home. The brains behind the operation is an automatic transfer switch that disconnects you from your utility after detecting an interruption in service. Once your home is safely off the grid, the switch starts up the generator before transferring its power to the home’s electrical panel. At the heart of the system is an internal combustion engine, which is usually fueled by the local natural gas supply. Where natural gas isn’t available, liquid propane or diesel stored in a large tank nearby can be used. Keep in mind these systems rely on a finite amount of fuel that could run dry if storm damage prevents delivery or increased demand hampers supply. When municipal power resumes, the switch shuts down the generator and reconnects your house to the grid. This seamless operation makes standby generators ideal for families with small children, as well as those needing uninterrupted use of electric-powered medical equipment. They’re also crucial for anyone running a home business. The transfer switch acts as a safety mechanism too: It prevents back-feeding electricity to the grid, a potentially lethal practice that can start fires and harm utility workers attempting to restore your neighborhood’s power. Contact Genpower today for your custom build or standard generator requirements and ensure you have a sufficient power supply during load shedding.